Karabiner MC: Greenland Expedition 2005. Tornarssuk (R) from the N.
This is the final story of the Karabiner Mountaineering Club's 2005 Expedition to the island of Tornarssuk, Southern Greenland, near Cape Farewell. We suffered an early disaster in that two of the team had to cancel only a week before the trip. Thus a mixed team of 5 headed out, on a tight schedule, by plane, helicopter and boat to near the mouth of Kukasik valley, on the west coast of Tornarssuk, an area not previously recorded as having a climbing team visit. The team had a mixed, generally poor bag of weather, but with at most 2 fine days in a row. Strong winds were a significant factor, destroying our mess tent and sending another (occupied) rolling away on the worst night. A fair amount of exploration was done, and some 'first' ascents of peaks 1388 (the island's highest point), 1230, 1090m and various 800m+ tops were made (even though 1090 took 4 attempts by wildly different approaches). Some climbing was done with up to 10 pitches (leading to a dead end on 1388m attempt 2 out of 3). Poor weather at the end prevented us from making use of the checking out of juicy looking climbs, so we know what to go back for! There's plenty of walls of all sizes and pinnacled ridges to play on (or run away from!). The expedition was considered a fair success by most, and some had their first experience of an expedition. The final reports, and routes climbed, are now available on this site. You can also see what "our" section of the island looked like, as well as viewing some of the members pictures. The Background: Following the Karabiner Mountaineering Club's 2004 Expedition to the island of Pamiagdluk, Southern Greenland, the seeds of a return expedition to the area had been sown in the minds of several of the team. The sight of cliffs and jagged peaks in all directions indicated potential material for many visits to come and it was difficult to leave. The expedition began with a small core group in November 2004 with a pile of marked up maps on the table - where to go this time? After the initial discussion, further research and several Emails, we found there were only a few holes in the exploration of the area. In the end it was the island of Tornarssuk, the next west of Pamiagdluk and which we had in mind as an interesting looking destination during the 2003 planning, that became the hot favourite. We could find little evidence of exploration and therefore had little more than the Aerial photographs to go on. 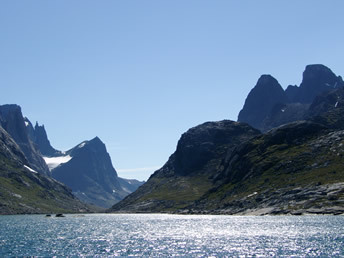 The linked island of Quvnerit had been visited in 2004 by a Swiss-German team, and contact with them encouraged us to press ahead. Due to work and home commitments, 3 of the old hands were lost, leaving the second time around leader, after further recruitment, with a team of 6 all new to Greenland. 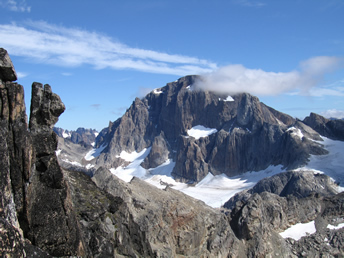 After establishing a basecamp on the west side of Tornarssuk (intended to be the Kukasit valley), the objectives were to be exploration and establishing of new rock and mountaineering routes of all grades (N of line through pt 1120m). Hiking and climbing peaks were also main objectives for the expedition for those of less experience of big walls. It was hoped that first ascents and first British ascents of peaks can be achieved. Close examination of the aerial photographs with the only available "map" show areas of likely steep rock and interesting ridges. Initially, the western and north-western flanks of pt's 1250, 1388 & 1230m appeared to have potential up the head of the Kukasit valley, with other smaller faces nearer the lakes. Pt 1230m looking the most attractive on the aerial photographs. Access over the 500m col to the next valley south is likely, with establishment of a good route being a priority, giving access to the complex of ridges and north facing walls that radiate from point 1120m, for example. North of Kukasit, the two principal sea cliffs could be investigated and we could have checked out the low tide access to Quvnerit at Itivdliaq as points 1080 and 1000m have good steep climbing potential. We were told there is lots of potential along the Itivdliap pularia fjord though it can be cold and windy here, and it really requires a boat. Coast walking is not likely for any distance - distant views give an impression of an almost impenetrable coastline, reinforced by on the spot inspection! We obtained support from the Gino Watkins Fund, the MEF, the BMC and the Club.